... and a weight-watchin' plan to stick to! Can't have it all, right? Wrong! 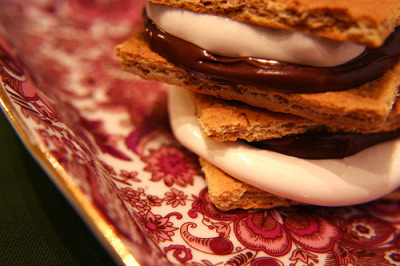 Check out this low-cal alternative (and a "stay in your air-conditioned house and punch a few buttons on the microwave" alternative) to campfire S'mores. 1. Spread Nutella on one graham cracker half. 2. Place marshmallow on the other graham cracker half. Microwave at HIGH for 10 seconds or just until marshmallow puffs. Take out and press the Nutella side onto the gooey marshmallow side. Oh yeah. OOhhhh...I love Nutella. I'll bet that's a pretty tasty treat indeed! Hey, I need good WW lunch ideas. I've got to lose some weight here before things get out of control. Lunch is my absolute worst thing of the day. I was wondering if you had any suggestions for me? I found our flags at the Emporium at Thanksgiving Point. $35 each Then I found them at Tai Pan Trading for about $10 cheaper. O well! That's the way it goes sometimes.